Those hours you spend driving each day will soon be interrupted with contextual advertising, pointing you to that Starbucks around the corner or the McDonald’s just down the street. Imagine this: You’re taking the family for a ride in your new Toyota, when you experience something unnerving. 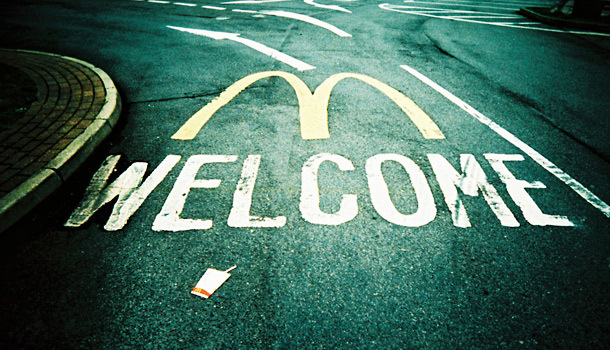 As you cruise past the local McDonald’s, the car radio begins playing “Happy Birthday.” There’s more. The lyrics mention your son by name and, eerily, it happens to be his sixth birthday. At the end of the song, McDonald’s offers him a free birthday meal, an offer which will expire in 30 minutes. A notion that was once the province of science fiction has become a reality, at least in Tokyo. While the latest preoccupation of advertisers is to secure space on smartphones or Facebook, a quieter rush for real estate has begun in the media industry. It’s a type of rush that’s never been seen before; it’s got nothing to do with your online environment, nor does it involve your cell phone. The new battleground is your car. TV’s lost its grip, with viewers declining and more using DVRs to skip over ads. Newspapers are searching for new revenue models. And as our demand for personal content grows, the space between the doors will become the battleground of the corporate titans. This should come as no surprise given the fact that the average American spends two to three hours a day in their car, making them a captive audience. And with more than 250 million registered passenger cars in the U.S. alone–and a couple of billion cars worldwide–the internal space of our motor car is about to be colonized. The time is ripe for the next generation of Contextual Branding–the art of sending the right message, to the right audience, at the right time. Japan is unquestionably the leader in this form of advertising. I have a crystal clear memory of my first encounter with it. I was in Tokyo and using a Do-Co-Mo phone when I received a message: “Martin, you have a friend in the area. Would you like to know more?” Naturally, curiosity got the better of me and I responded with a quick “Yes.” Within minutes it got back to me. “Starbucks would like to sponsor your meeting–please accept.” And so I did. A map appeared on my phone directing me to the nearest Starbucks, along with a coupon for a cup of coffee for two. I made my way over and there was a friend who I had not seen in six years. Thanks to Starbucks we reconnected over a cup of coffee, and then another. Impressive as this story may appear, it’s old news in Japan. They have moved on from messages that rely on coincidences of time and place. They’re working on a future where the media can target potential customers with bull’s-eye accuracy and they’re willing to pay for personal information with hefty discounts. Personal information about the car’s likely passengers. This is a powerful cocktail of information. In principle, the car would know when you’re likely to feel hungry as well as what food you’re likely to eat. It will know when you will be buying gifts and at what point you’re most likely to be receptive to commercial messages. And all this will occur during your three hours of driving a day. The car space is theoretically a virgin space. Almost all the information you receive is passive, no matter where you are, who you are, or what rocks your particular boat. This is a space that industries will fight to gain ownership of in order to convert it into a contextual space. One can only wonder who will win the race: the media industry, the online search industry, or perhaps the telecommunication industry. Toyota, Google, News Limited, or Apple? Will the car industry have the foresight to team up with its competitors to create a propriety navigation system for the vehicles they manufacture? Will Google end up dominating the vacant car space by using its Street View and positioning systems? Will News Limited be able to convince us that news is king, particularly when it’s customized to suit your particular taste? Or are we so attached to our Apple products that we can’t imagine using anything less than its propriety Apple navigation format? As of now, no one can lay any clear claim on this highly attractive market space. GPS navigation systems are already featuring logos for gas stations, fast food restaurants, and banks. It has only just begun. But as we continue to spend hours a day stuck in a car, there’s not a whole lot we can do about it, but receive commercial messages. Martin Lindstrom is a 2009 recipient of TIME Magazine’s “World’s 100 Most Influential People” and author of Buyology: Truth and Lies About Why We Buy (Doubleday, New York), a New York Times and Wall Street Journal best–seller. 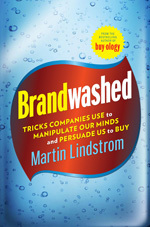 His latest book, Brandwashed: Tricks Companies Use to Manipulate Our Minds and Persuade Us to Buy, was published in September. A frequent advisor to heads of numerous Fortune 100 companies, Lindstrom has also authored 5 best-sellers translated into 30 languages. More at martinlindstrom.com.